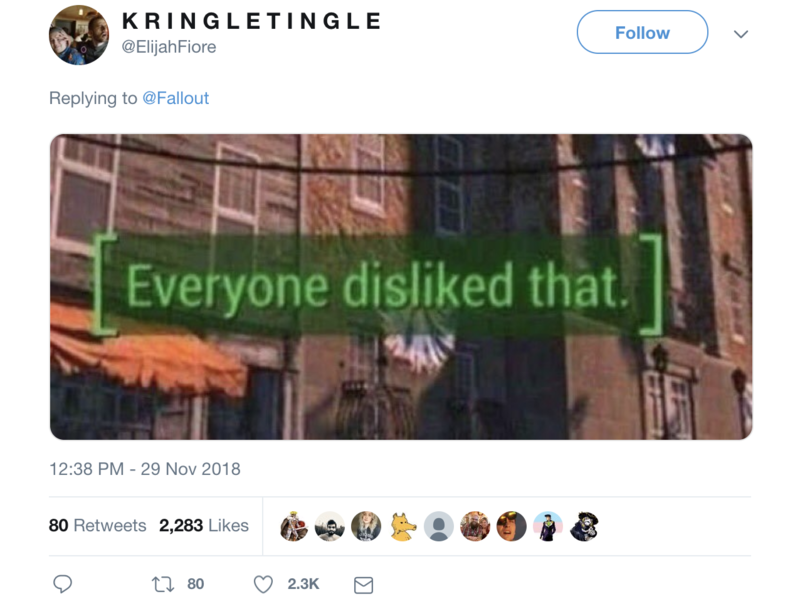 If you’ve been anywhere near Twitter or Youtube recently, chances are you’ve come across the heaps of backlash Bethesda have been receiving for their latest title in the critically acclaimed Fallout series. 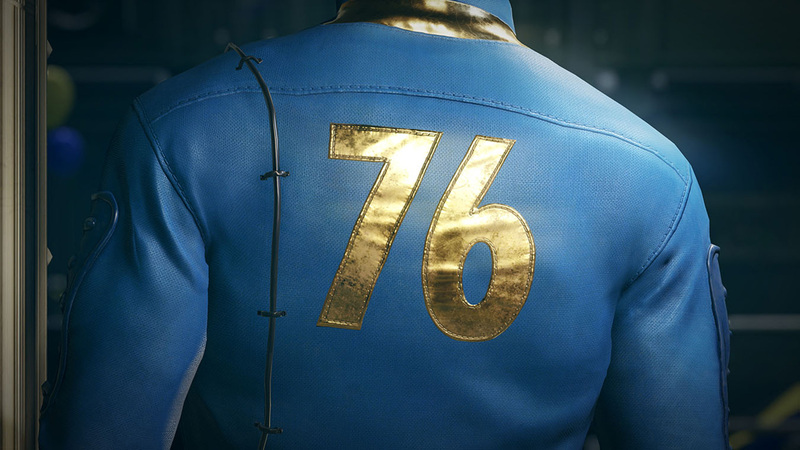 Fallout 76 has seemingly taken a tumble and is showing no signs of getting back up any time soon. The multiplayer post apocalyptic open world West Virginia simulator has flunked compared to its predecessor – Fallout 4. To make matters worse, Bethesda have found themselves in hot water and fighting battles on multiple fronts. As a result of this, the game has been heavily discounted during black friday and other sales despite only being on the market for a fortnight. On Monday, the game was $35: almost half of the game’s RRP. Although the game has returned to its original price, it’s likely we’ll see another major decline by the time Christmas rolls around. Why is it falling in price I hear you ask? 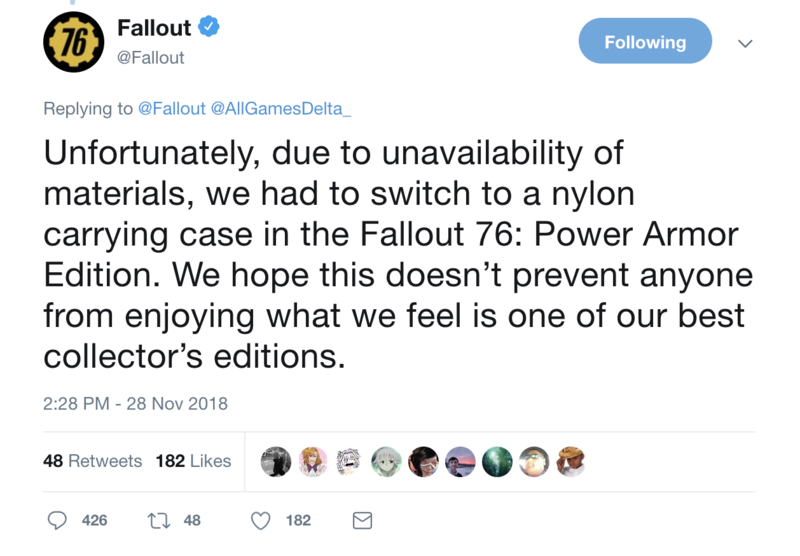 Apart from the game tanking sales numbers, Fallout 76 is jam packed with technical issues. While Bethesda’s catalog of games are infamous for containing dozens of bugs, they often add a layer of comedic effect. Fallout 76’s bugs are no laughing matter though as they’ve created a whole heap of issues for players and, in some cases, making the game unplayable. Perhaps the most ridiculous kerfuffle to emerge since the game’s launch is the bag included in the collectors edition. 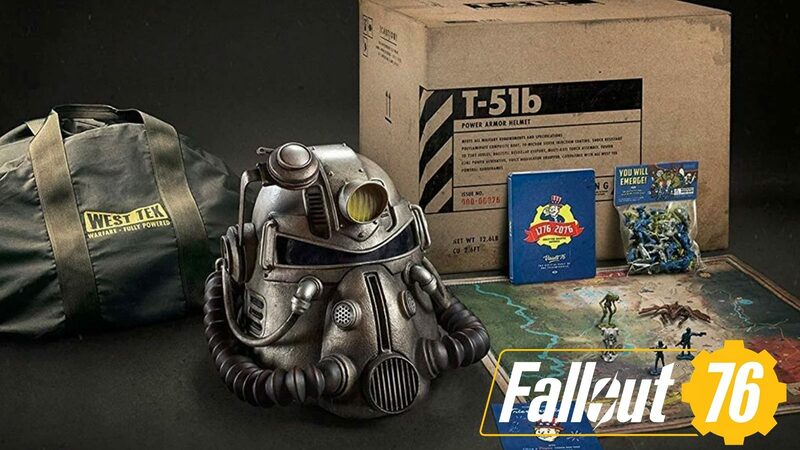 For $199, customers would receive the game in a steelbook case, a glow-in-the-dark map of West Virginia, a pack of fallout-themed figurines, a life size T-51 power armor helmet and a West Tek CANVAS bag. For compensation, Bethesda offered 500 atoms (Fallout 76’s virtual currency) which translates to a measly $5. 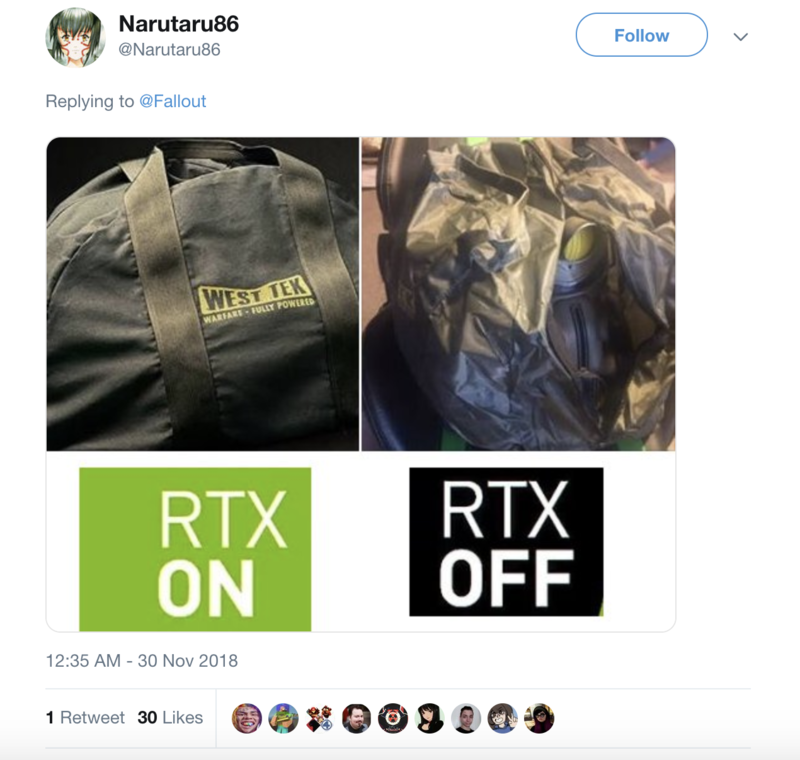 There’s no better way to say we’re sorry than offering up a handful of atoms which ironically can’t even buy you the in-game duffel bag, as pointed out by PC Gamer’s Chris Livingston. Some have interpreted this move as a loophole to avoid refunds by voiding the product’s eligibility if the 500 atoms are redeemed. Speaking of refunds, Bethesda have backtracked on their refund system, stating that anyone who has downloaded the game are not eligible for a refund. One user on /r/gaming has written a step by step guide on how players can receive their money back via chargebacks which runs the risk of getting your account banned on your respective platform and could possibly land you in trouble with the law, especially in the UK where chargebacks are guaranteed to put you through legal hell. If you’re one of the customers affected by Bethesda’s refund practices, there’s a shimmering light of hope called Migliaccio & Rathod, a Washington D.C. based law firm who have a history of dealing with gaming related, finance related and false advertising related issues. The firm have launched an investigation into Bethesda over deceptive trade practices and vow to deliver justice to PC players affected by the now non-existent refund policy. 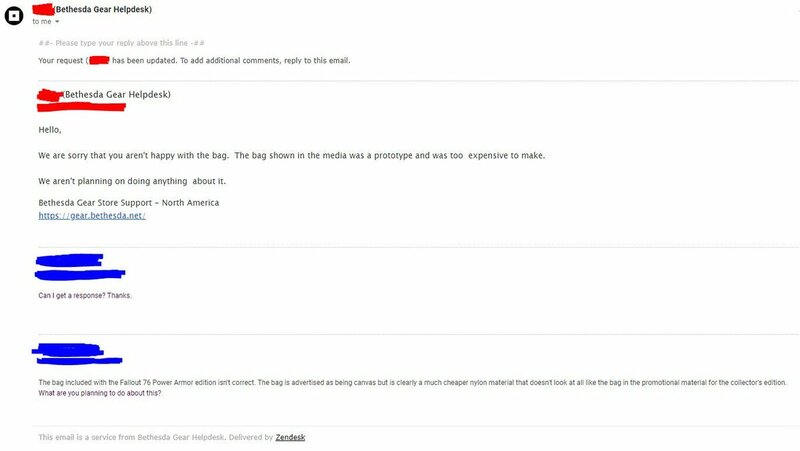 The firm are also looking into bag-gate. In addition to launching the investigations, Migliaccio & Rathod have asked people who have been affected to reach out to them confidentially via their questionnaire. Regardless of whether you enjoy the game or not, Bethesda have undoubtedly landed in hot water and aren’t getting out anytime soon, especially with a lawsuit on their doorstep. This is why I couldn't buy this game. The game is just a hot mess that isn't at all finished, and Bethesda blatantly screws over their community. No refunds on digital/PC purchases that could lead to legal issues? That's just wrong in so many ways. Great article man!